The legislators were fuming at their mobile phones being confiscated by the resort manager. They even had a verbal exchange over the issue. 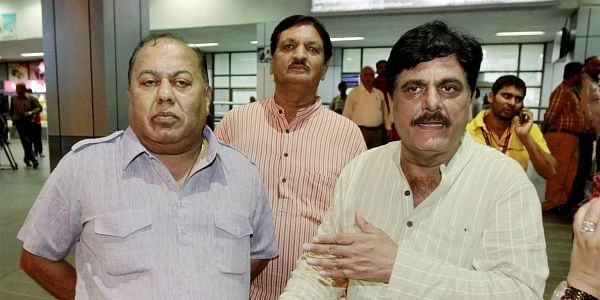 BENGALURU: The Congress herded 44 of its MLAs from Gujarat to Bengaluru ahead of the August 8, Rajya Sabha elections, in order to avoid poaching by the BJP. But its worries have not ended. There's already a rebellion brewing in Eagleton resort, where the MLAs are housed after they arrived in Bengaluru from Ahmedabad in the wee hours of Saturday. The MLAs were angry at not being able to keep in touch with their constituencies at a time when their home state, especially south Gujarat, was reeling under floods. Three MLAs from south Gujarat, including Dharshibhai Khanpura from Kankrej, Mahesh Patel from Palanpur and Govabhai Rabari from Deesa constituency, expressed their displeasure at not being allowed to use their phones and demanded to return home. "These constituencies are most hit by flooding. MLAs from these places wanted to speak to people and officials in their constituency. But the resort manager Naresh Rawal who took away their phones refused to return them to the MLAs," sources said. Meanwhile, senior Congress leaders from Gujarat are expected to fly down to meet the disgruntled MLAs and take a call. The MLAs were brought to Bengaluru after six legislators quit the party to join the BJP over the past two days. With Ahmed Patel, political secretary to AICC president Sonia Gandhi, set to contest the election to a Rajya Sabha seat from Gujarat, the party high command is determined to ensure his victory. The Congress had earlier suffered an embarrassment with cross-voting by a section of its legislators in Gujarat during the presidential elections. party leader Saleem Ahmad who is also additional special representative in New Delhi from Karnataka, were taking care of Gujarat MLAs at the resort on Mysuru Road, 22 km away from Bengaluru. It's located in Bidadi in Suresh’s Bengaluru rural Lok Sabha constituency. Suresh told Express, "We are taking care of the MLAs. They arrived here late in the night and are taking rest at the resort." He said they would be taken to a temple but didn't specify which one. "The KPCC is only coordinating their stay and other facilities and not paying for their expenses,'' he added.